ashlee nicole spills | blog: Chris Brown HITS IT Off of Twitter. If you're following him on twitter, then you know that Chris Brown hasn't been the happiest camper for the past couple of weeks. The fact that a myriad of cd outlets refused to stock his new album Graffiti on shelves caused Chris to get pretty ticked off. 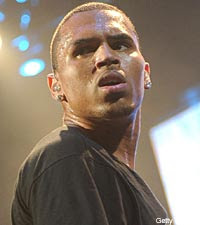 Chris slightly threw a hissy fit on twitter as he was very disturbed by stores "blackballing" his album. His latest tweet was a hit at a Wal-Mart store in Connecticut. Apparently, Chris visited the store and saw that his cds were NOwhere in sight or even in stock. He went OFF via Twitter. Of course I'd love to have a screenshot of those tweets, but unfortunately @MechanicalDummy is no longer a tweeter. Guess he couldn't take the heat.